1, Sacrifice a creature: you gain life equal to the sacrificed creature's toughness. My Balthor deck was initially a zombie-themed deck until I was tired of it and changed the strategy into a reanimator deck. At first it was just a big mana control deck, with Balthor as a support when your hand was empty and you needed more gas. Slowly it turned into a more combo-control deck with dredge elements. 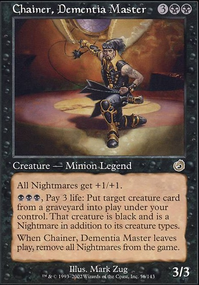 Chainer needs a more dedicated deck, with more cards to protect him (Lightning Greaves), more sacrifice outlets, and more life gain effects like Sangromancer, Dross Harvester, Disciple of Griselbrand, Pristine Talisman, etc. That means less available card slots, less fun with big demons. Chainer is also more slower. 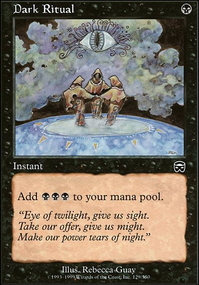 You need a sacrifice outlet and 8 manas to be effective the turn you play him. Over Balthor, Chainer is better in some way: he can target any graveyard, and you don't have problem if your opponents play black and/or red. 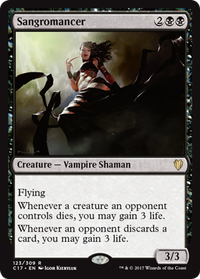 He can be fast too with more Dark Ritual-like cards, which are more-or-less dead cards if you don't play combo. So I prefer Balthor because it fits more what I'm looking for this deck: big reanimation turns with a high creature count. 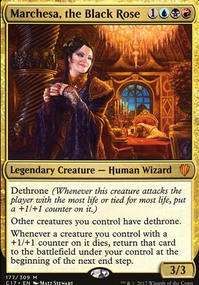 For many years, Chainer was in my Balthor deck as a backup plan. He was finally cut for more faster reanimation options. I've tested Black Market. For me, it's a 5-manas do-nothing the turn it comes into play. Too slow. It also attracts hate from your opponents. I suggest it if you play Exsanguinate or Torment of Hailfire. I don't because I try to increase my creature count for more Balthor efficiency. Noxious Gearhulk: I like it too, but can't find a free slot for it at the moment. Marionette Master: It better fits in an artifact deck. If it's played for its token, there are more effective ways to produce tokens in black. Don't know much about artifact sac outlets but as far as creature sac outlets go there's Viscera Seer, Carrion Feeder, Yahenni, Undying Partisan, Blood Bairn, Nantuko Husk, Spawning Pit, Bloodthrone Vampire, Vampiric Rites, Disciple of Griselbrand, Altar's Reap, and Bone Splinters, Hell's Caretaker, Ayli, Eternal Pilgrim, Phyrexian Plaguelord, and Whisper, Blood Liturgist off the top of my head. There's also Phyrexian Altar but it's not cheap. You can probably find more of these effects as well as artifact sac effects on gatherer. BurtReynolds: Contamination is way too good to cut. With all the recursion, Gravecrawler, Bloodghast and Reassembling Skeleton it’s just too powerful in my meta. It locks people out while dedicating very few resources to do so. 10/10 would bang. Also, cutting a card based on potential target or hate value is not always a valid reasoning when making cuts, and I think that’s probably the case here. Thoughtpicker Witch is actually a pet card of mine. It’s not super high value just because of variance, but it’s so sweet to exile combo pieces and stack draws while I’m building a win. This is the second time people have mentioned Nantuko Husk though as a potential cut. And I think I like Wurmcoil Engine more than Disciple of Griselbrand. So I think final cuts would be Disciple for Wurmcoil and the Husk for Messenger. I’m not sure cutting the Husk is a good idea because it’s more of just a sac outlet than a beatstick, but I want to try Messenger. Disciple for Wurmcoil is good value though and I think in the long run, Wurmcoil will prove the better card. Thoughtpicker Witch/Disciple of Griselbrand: Yes they are cheap sac outlets, but I don't like how they always costs one mana, unlike Viscera Seer/Sadistic Hypnotist, so if you end up with a bunch of tokens and someone drops a Massacre Wurm you can't easily clear your board. 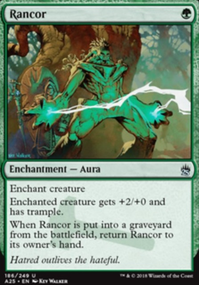 Carrion Feeder/Nantuko Husk: Better sac outlets because of no mana cost, but I find that it's so obvious how quickly they can be pumped that opponents are always ready to spot remove them before they can do anything. 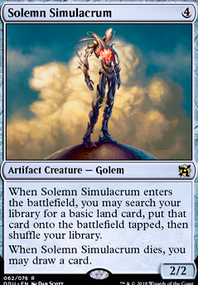 Contamination: Maybe an odd recommendation as it can be very powerful, but again I've found that unless you really commit to the stax line of play it's too easy for opponents to be on the look out for this one card and just ping it as soon as it drops. Perplexing Chimera and Unspeakable Symbol could be interesting. Perplexing Chimera lets you cause a little chaos and Unspeakable Symbol lets you return your opponents' creatures to the battlefield after you sac them. 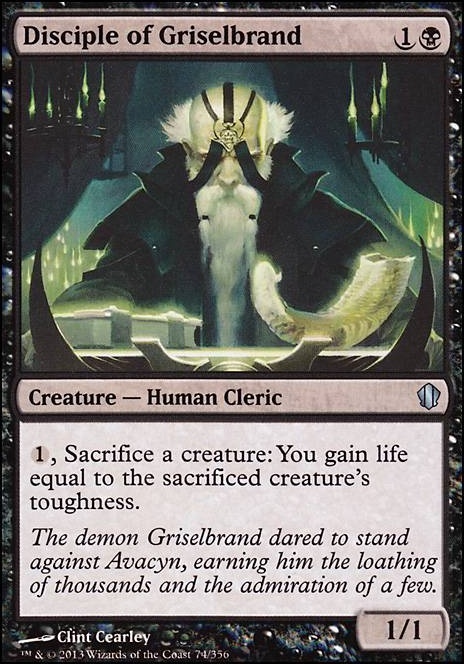 Also, Disciple of Griselbrand is a pretty good sac outlet. @Se7enfoot I understand but, Woh, you made a lot of changes in your deck. For the better, although no more Scion of Darkness! 1) Instead of Lightning Greaves, Shaman en-Kor. Why? Three reasons. Firstly, the casting cost is the same, that is 2. Secondly, Shaman en-Kor ability can be activated as an instant (also during the turn of your opppnent) whereas Lightning Greaves can only be equiped as a sorcery (during your turn only). Thus, if you activate the Shaman ability to boost a cleric toughness with Daru Spiritualist it can serve a defense guy against big monsters, before you sacrifice it for big life. One common mistake, is to think that the Shaman en-Kor ability can not be activated unless it receives damage. That it is not the truth: the Shaman can target a cleric, regardless of whether it received damage: "You can use this ability as much as you want prior to damage being dealt" - . Also, the shaman can redirect damage to itself: "It can redirect damage to itself". Third reason: the Shaman is a Cleric, unlike the Lightning Greaves. 2) Starlit Sanctum instead of Disciple of Griselbrand. Why? Disciple of Griselbrand costs 3 in order for you to use the ability: 2 to cast the creature, plus 1 to use its ability. Starlit Sanctum costs 1. Plus, Starlit Sanctum lets you choose between gaining life or taking life from your opponent, thus complementing the damage of Cabal Archon. 3) You should add one more Test of Endurance. Why? If yours gets destroyed, you will get no second chance to use it again. 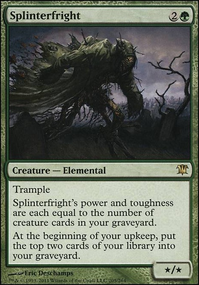 The more so when you have no Devoted Caretaker or Eight-and-a-Half-Tails in your deck to protect it.